No one ever connects them to these events and no one misses the money. It is the perfect crime. No one ever knows… no one, that is, until more than twenty years later, a beautiful girl tells Jerry Pilgrim the whole incredible story as they lie together one morning in a big bed in a small cottage in a pretty Northamptonshire village. For Jerry the knowledge of a secret that could destroy some of the country’s most powerful men is just too tempting, so he sets out to commit his own audacious crime. But someone else, it seems, knows the secret – for wherever Jerry goes, death precedes him. You see, everybody wants… money for nothing. 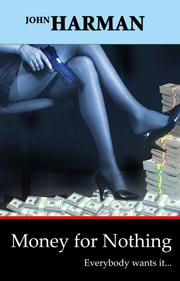 John Harman’s absorbing thriller about a gigantic and ingenious fraud is peopled with men and women whose love of money drives them on to outrageous crimes. From the discreet Swiss bankers to the ruthless Mafia bosses, from the bloody guerrillas to the high-ranking men of the English professional classes, greed is the theme and blood is the price.